In our United States there exist three roadside attractions that are in a league of their own. 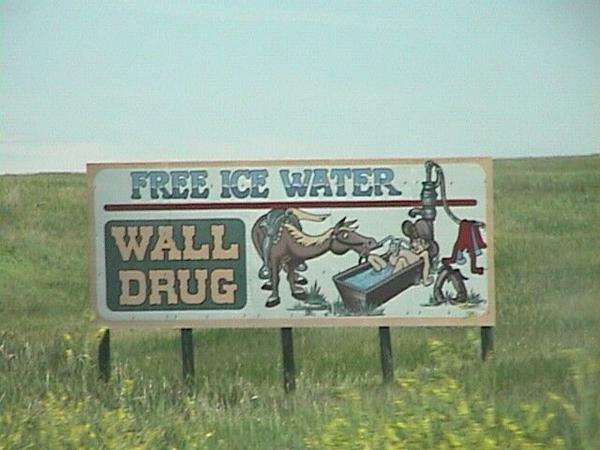 From west to east, these are: The Thing, Wall Drug, and South of the Border. 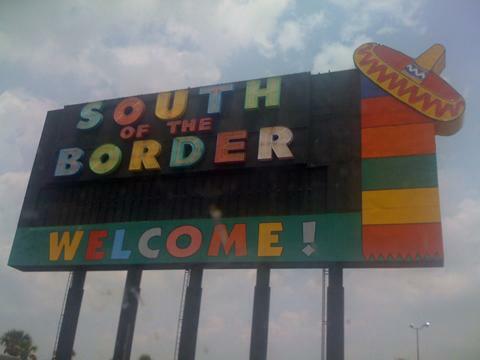 What binds these three wonders of the world of interstate kitsch together is probably the advertising. Each have put up billboards that not only start at impossible distances away, but each also have an impossible number of billboards. You simply will not be able to count them, as they are on multiple interstates, teasing even the travelers who will never pass by, deprived of even the opportunity to stop and enjoy these sights. The billboards are also old. They are also specifically designed to wear you out. They are designed to create a sense of wonder in the passengers of the vehicle, so that by the time you get to the exit where this mecca (of what is sure to be pure crap), is located, you have been beaten down. Beaten down so hard that against your better judgment, you find yourself actually curious, and more importantly, willing to stop. If you aren’t familiar with any of these three locations then what exactly are you doing with your life? 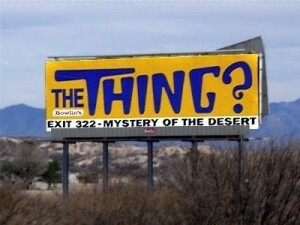 The Thing is located on I-10 in Arizona. It is probably the most enigmatic of them all, as most of the bright yellow billboards are simply a series of non-questions posed to the merry traveler about the mysterious contents of this stop off. “The Thing?” Clearly, the only way to find out what The Thing is, is to stop and pay roughly one dollar and tour the museum to find yourself staring open jawed and drooling at the audacity of The Thing itself. It truly is a sight to behold, and generally speaking, if you haven’t seen it yourself then you will be hard pressed to pump any information out of those who have indeed paid to see The Thing. I ain’t telling. You can be on your death bed, and I will tell you to get in the nearest hearse and go there your own darn self. I didn’t burn with curiosity for hundreds of miles, exit, buy crappy souvenirs and spend an hour I couldn’t afford just so I could spout off to the next guy what all the hubbub was about. 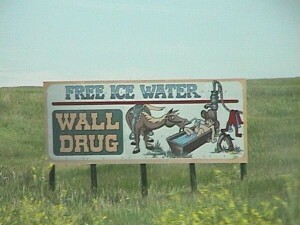 Wall Drug, on the other hand, in South Dakota, is arguably the originator in the art of compelling the traveler to stop. It all began some 77 years ago with the simple proclamation “Free Ice Water.” It has grown since then, and while I must admit I haven’ been there since I was a youngster, it’s memories of giant jack-a-lopes and scale models of Mount Rushmore and coonskin hats and taffy taffy taffy is still crystal clear in my mind. You can easily kill over an hour at either of these places. South of the Border is not humble. Much to my enjoyment, the pure classlessness of this place is evident from hundreds upon hundreds of miles away. And I wouldn’t have it any other way. South of the Border is a Mexican themed gift shop extravaganza. And, why the hell not? After all, Mexican themed food places are everywhere. And while, as a general rule, one should not eat Mexican food in any location that does not border Mexico, apparently this rule hasn’t been explained to all the places that do not border Mexico. Washington state has Taco Time restaurants. Kansas is home to Taco Tico, Nebraska and Iowa hold dear to their Taco John’s. (For the life of me I can’t understand why they just don’t call it ‘Taco Juan’s’.) And each of these places purports some degree of Mexican authenticity. And while many of us would scoff at the notion, those of us who have had the displeasure of intentionally ingesting anything from Chico’s in El Paso know that just because it border’s Mexico and is owned and operated by real live Mexicans, doesn’t mean it tastes any good at all. However, I once had “Mexican” food in Cambodia. And while it didn’t exactly feature the same taste sensations as the Mexican food I have had within the actual border of Mexico, it did however have some authentic experiences to offer. The food was impossibly inexpensive. The kitchen was limited and simply couldn’t offer everything on the menu at all times. (Which is the hallmark of a REAL resturaunt if you ask me. Honestly, should there be an endless supply of shrimp pasta in Idaho? The Boise Olive Garden would have you think so, and wrongly, in my opinion.) Furthermore, it was run by a family, and had terrible amateur murals all over the walls, and had the inexplicable Mexican attribute of 365 day Christmas lights on its exterior. All this to say, just because one is far from the border does not automatically mean one cannot have an experience that is in concert with an experience one might also have in Mexico. South of the Border however, is NOT one of those experiences. 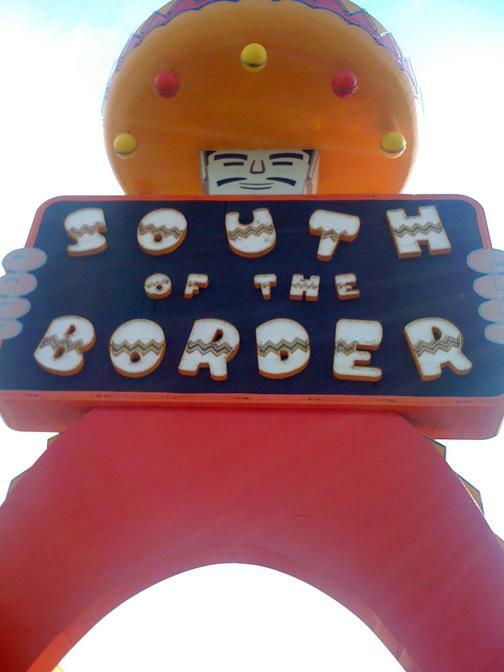 No, South of the Border is ridiculous in ways that defy measurement. 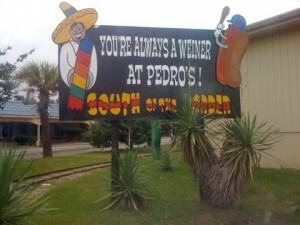 The mascot, a very un-pc looking gap-toothed little Mexican dude, is named Pedro. He, apparently, is the curator of the place, and welcomes you from outside glances from your windshield with such clever phrases as “You’re always a wiener at Pedro’s!” Pedro will pass up no opportunity to make English words sound like they are spoken with a less articulate accent than Cheech and Speedy Gonzales combined. You might think that a giant 3-d pork link attached to a billboard stating “You never sausage a place” is as unsophisticated as the humor will get. But you would be wrong. 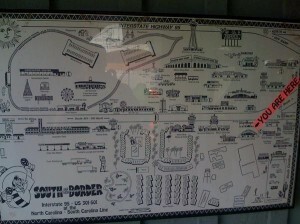 Dozens and dozens of billboards are inviting the traveler to stop at this one of a kind gift shop extravaganza. This gift shop is big. Very big. It has multiple buildings. Remember, this place has no reason. It doesn’t need to be here. It is merely a place to stop when traveling the east coast. 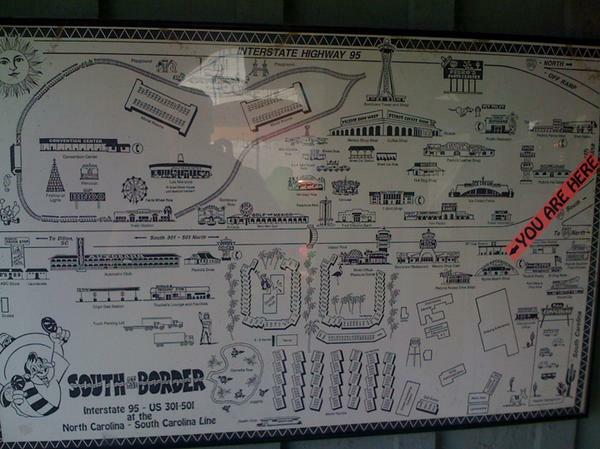 But aside from purchasing gasoline and some souvenirs, you might also think to pick up a map of the grounds, because you will need one. I didn’t find one I could keep for my self, but I did spot some handy-dandy “you are here” style maps affixed to the entrance halls of various buildings on the property. Now before I show you the photos of all these buildings you must know something. South of the Border is dying. Motorists clearly aren’t stopping anymore. There is probably a finite number of vacationers who still drive the distance to Florida or Myrtle Beach who have not already stopped at SOB once. And, though I find SOB to be enthralling, I recognize I am in the minority and I must admit that to average Joe Traveler, once is really enough. It’s kind of a sad place. There are entire buildings of hotel rooms that haven’t seen a guest in years. There is a ferris wheel that doesn’t turn, there is a 165 foot tall, giant sombrero who’s elevator seems to never rise. Various actual humans who live nearby have confirmed that in the last few years, SOB is seeing a lot less action, and many folks cannot remember seeing it during a time when it was bustling. Maybe the heyday of SOB has gone the way of the buffalo. Of course, this actually makes it all kinds of special to me. While I might love to see this place shiny and new and full of fresh faced families enjoying the times of their lives, there is something to be said for half-death. There is a period when an attraction of any man-made kind, is no longer current, hip, modern, or functional… but still hangs around. Maybe it’s just nostalgia, but I really like that time period. For instance, there was a time when Captain EO was still located at Tomorrowland in Disneyland. Once it was the epitome of ‘amazing’ and ‘hip’, but after a decade it slowly became a parody of itself in the face of newer, better visual effects, and the realization that our hero had no longer the same face, skin tone, or gender as when the attraction was new. In my opinion, this is exactly when it Totally Rules. When something REMINDS me of a time when the world was more technologically innocent, when humanity was more easily stimulated, and when a giant stone parody of a Mexican with a ridiculous grin and oversized hat was a reason to pull your car off the interstate and stay a while, I love it. *To ironically enjoy something might be one of the best ways to enjoy something. * I mean, when was the last time you paid to ride a carousel and caught the brass ring with an outstretched arm and enjoyed it because it was just purely enjoyable? Not since childhood. But if you have been to Muskegon, MI and done that on a real wooden horse, on a classic carousel, as an adult, you may experience ironical enjoyment. And that means this. You CHOSE to enjoy yourself. You recognized you are not a child, and decided to remove the chains of disbelief in childish pleasures, and took it upon yourself to enjoy something for its rarity and for its intentions. When you actively decide to take in amusement not as yourself, but as what you want to be, if even for a moment, well that, Danny Boy, is an experience not to be diminished. Now be careful to note, that ironical enjoyment often borders on condescension if approached incorrectly. Yes, you and your high falootin’ ways may act like you are enjoying crappy entertainment while mocking those who earnestly ARE enjoying it. Shame on you. I am telling you your joy should be equal, which means the other people at The Worlds Largest Ten Commandments who is there for spiritual reasons are not to be mocked. Wait until you get into your car.